Don’t be a DIY Carpet Cleaning Horror Story! The internet is a wonderful thing. A world of answers is at our fingertips so when something needs to be done the first thing we do is Google it. Sadly, there is also a lot of bad advice floating around the web when it comes to removing stains and soiled areas from carpet and area rugs. While some carpet stains can be dealt with using DIY cleaners and a spray bottle, not all DIY carpet cleaning products work. Some of them can even be harmful! 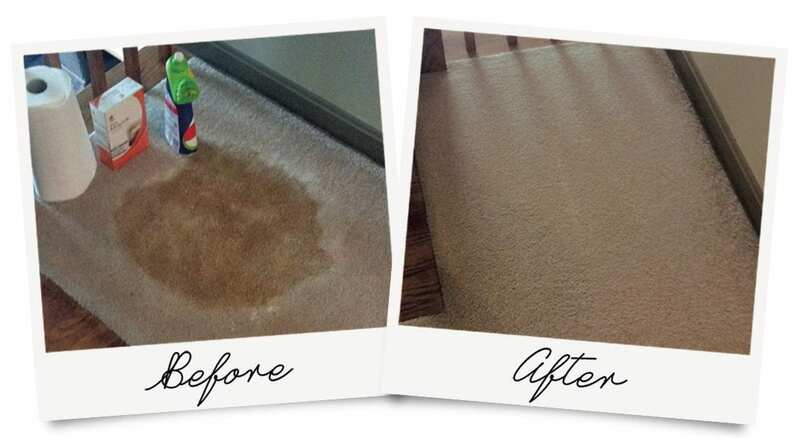 This poor carpet just wasn’t responding to DIY carpet cleaning, so AmeriClean came to the rescue! When it comes to homemade carpet cleaners and do-it-yourself carpet cleaning suggestions, please don’t hesitate to call upon us. No matter what you put ON the carpet, there’s so much more chemistry and methodology that goes into CLEANING the carpet properly. It’s important to get the dirt and grime OUT of the carpet fibers, not just put chemicals or DIY carpet cleaning mixtures on top of the stains. No one wants dirty carpet! Our truck mounted carpet cleaning equipment, along with state of the art extraction methods and safe detergent solutions will leave your carpets looking, smelling, and feeling as clean as they can be. Many people turn to DIY carpet cleaning tricks because they are worried about using harsh chemicals in their homes and around their children and pets. We are happy to talk with you about a natural carpet cleaning solution, and can even customize our carpet cleaning service for your unique needs.